Crowds have flocked to London’s Royal Festival Hall desperate to get tickets to see Michelle Obama. The former US first lady will be talking about her memoir, Becoming, at the Southbank Centre with novelist Chimamanda Ngozi Adichie, on December 3. Tickets for Michelle Obama at Southbank Centre on 3 December have now Sold Out. Tickets sold out quickly and fans on social media said thousands of people were in the queue. We're currently experiencing extremely high levels of demand for Michelle Obama tickets both online and on our phone lines. Your patience is appreciated. 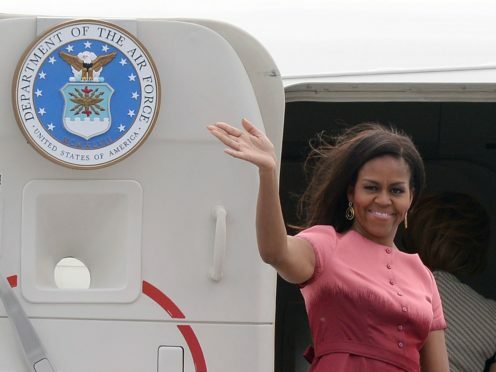 Obama will talk about her childhood and “her years as an executive balancing the demands of motherhood and work to her time spent at the world’s most famous address”. She “will also share life lessons learned, and inspire people to become the very best version of themselves”. The venue said it has asked for tickets on the site Viagogo to be removed. Naah @PenguinUKBooks if you're behind the Michelle Obama event at Southbank I'd recommend an urgent rethink of venue and move it to a bigger venue…Thank you! People tweeted that they had been queuing since the early hours and demanded that a bigger venue, such as a stadium, was booked. A spokeswoman for the Southbank Centre said: “The capacity of Southbank Centre’s Royal Festival Hall is just over 2,700 and due to extreme demand for this event, unfortunately there will be people who are disappointed at not being able to purchase a ticket.